Questions-What does the first dental visit include? ~What does the first dental visit include? ~Why do I need a dental exam and cleaning every six months? If after toothbrushing, a small amount of plaque remains, that plaque overtime turns into tartar(calculus). Once that happens, the tartar has to be removed by the dentist. Every person has different needs, but 4 or 6 months intervals are most commonly used to schedule people for their professional cleaning. 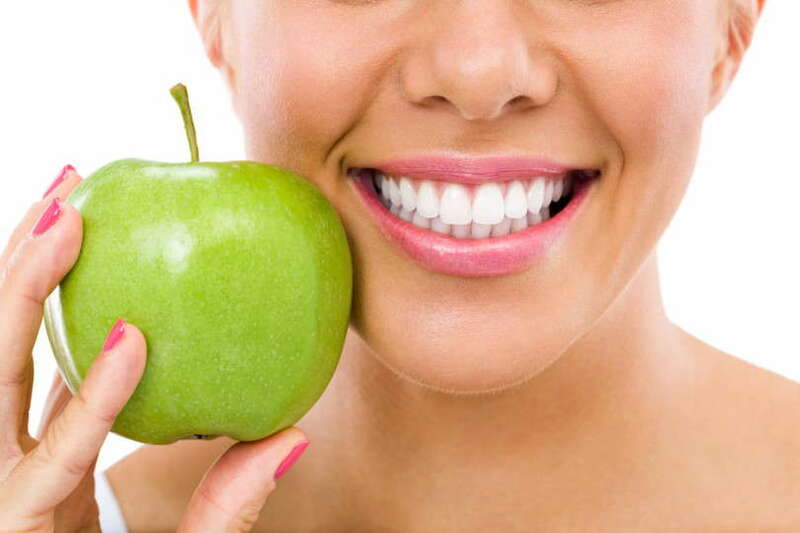 ~ How can we prevent cavities and remineralize tooth enamel? Chew sugar-free gum: Increases saliva flow.Saliva helps kill bacteria and contains proteins and minerals to protect tooth enamel and prevent decay, gum disease and bad breath. Good oral hygiene : Brushing at least twice daily and flossing regularly ,help remove the plaque that feeds acid-producing bacteria. Use a fluoride toothpaste: Fluoride is a mineral that not only prevents tooth decay but also reverses it in early stages. 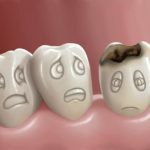 ~Sensitive teeth: What is the cause and how is it cured? 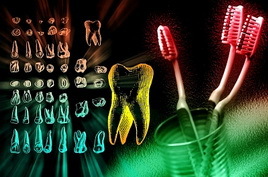 Sensitivity to hot and cold substances is a common dental problem. It occurs when dentin (the second layer of the tooth) loses its hard enamel protective coating. The dentist can recommend certain toothpastes that are designed to reduce sensitivity. Another solution is to apply a chemical sealant in order to form a protective layer on the tooth. Hypersensitivity may also be a signal of more serious dental problems. If you are experiencing chronic hypersensitivity, you need an evaluation from your dentist. 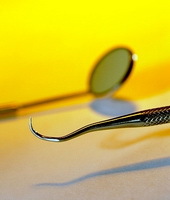 ~Is it always necessary to replace a missing tooth? Replacing a missing tooth is usually the correct course of action. This could trigger occlusal problems and compromise the prognosis of adjacent teeth. ~For what conditions may Dental implants be the best solution? * To replace missing teeth. Especially in cases where the posterior teeth (behind the canines) have been extracted and the only solution would be a partial denture. * For stability and retention of overdentures in patients with severe bone loss. 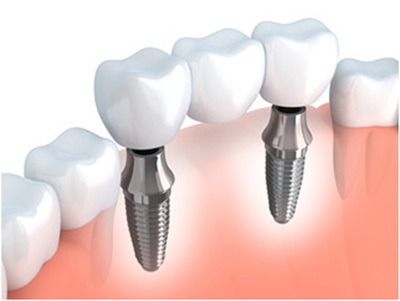 ~What are the advantages of Dental implants? * Tooth structure is preserved because there is no need to cut down adjacent teeth for conventional bridgework. * Long-term studies on implants conclude that restorations on implants last for a longer time than conventional restorations on teeth. * Implant overdentures improve biting, chewing efficiency and speaking due to improved support, stability and retention in comparison to loose fitting dentures. * Implants preserve the adjacent bone on edentulous patients who loose faster bone when they use conventional full dentures. 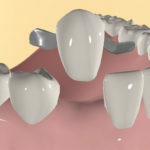 ~What are the disadvantages of Dental implants? Dental implants require a greater financial investment than other alternatives. Also they take several visits over a period of several months to complete. In some cases, the time frame for treatment can be considerably shortened with the final teeth delivered in only a few weeks or days. As in any surgical procedure, dental implants involve a small risk of infection. Successful integration of dental implants cannot be guaranteed but most studies show 95% or more success rate. Mechanical fracture of fixtures, bridges, abutment screws or loosening of screws can occur. These problems have been reported in less than 5% of the patients. Porcelain fracture of crown and bridgework on implants is much more prevalent than on natural teeth due to the fact that implants have no mobility. Bruxism or “gnashing of teeth” is an oral parafunctional activity that occurs usually at night, during sleep. A dental guard or splint can reduce tooth abrasion.It is typically worn during sleep at night. The splint not only protects the teeth but it can also reduce muscle strain by allowing the upper and lower jaw to function properly. ~What are the symptoms of the Temporomandibular Disorder (TMD)? ~What is the treatment of the Temporomandibular Disorder? The patient is encouraged to follow simple instructions such as to avoid wide opening of the mouth,to avoid eating hard foods and to take analgesic drugs when in pain. In most cases a splint (night guard) is recommended by the prosthodontist in order to protect teeth from further damage. In addition, the use of TENS units in the dental clinic helps loosen up jaw muscles. In more severe cases surgical therapies could be recommended. It is a restoration which consists of one or more pontics (replacing missing teeth) supported by thin metal retainers placed lingually and proximally on the abutment teeth. Minimal tooth structure needs to be removed. Because of the conservative nature of the preparaton, the potential for pulpal trauma is minimized. Anesthesia is often unnecessary in order to prepare the teeth. Much less periodontal irritation results in comparison with the conventional bridge. The primary disadvantage relates to the longevity of the prosthesis. Debonding rates increase with the time elapsed after placement. Also with this technique we have less ability to alter the shape and sizes of the teeth. Another disadvanage is the limited number of patients in which this technique can be used. ~What are the causes of bad breath and how to stop it ? Poor oral hygiene. SOLUTION: Brushing twice daily,flossing and mouthwashing ensure the removal of small particles of food that can build up and slowly break down, producing odor. Foods with strong odors (onions,garlic,etc). SOLUTION: Avoid food with strong odors or after eating them, drink milk or chew parsley. Dry mouth.SOLUTION: Drink plenty of water, avoid oral rinses with alcohol and chew sugar free gums. Gastroesophageal reflux.SOLUTION: Evaluation and treatment by a gastroenterologist. Low intake of carbonhydrates.SOLUTION: Improvement of daily nutrition. High consumption of alcohol.SOLUTION: Avoid drinking alcohol with an empty stomach and reduce alcohol intake. Smoking.SOLUTION: Regular brushing and flossing of teeth, brushing of the tongue and chewing suger-free gum. Diseases. Individuals who suffer from diabetes, lung disease, kidney disease, liver disease, cancer, respiratory infections or metabolic disorders often experience bad breath due to dry mouth.SOLUTION: Follow instructions for dry mouth. Medications (including antihistamines – antidepressants) can cause dry mouth can cause bad breath.SOLUTION: Follow instructions for dry mouth. Mouth infections (cavities, gum disease, or impacted teeth). SOLUTION: Dental consultation.